A Missouri Adventure reflects the Garden’s leadership role in connecting children with plants and nature and is the centerpiece of the Garden’s efforts to attract and serve young families. Set amid a lush landscape of trees and native plantings, organized around themes of adventure, discovery, botany, and frontier settlement, the Children’s Garden provides the perfect setting for guided explorations and self-discovery. Four of Missouri’s ecosystems are represented, including cave, aquatic, prairie, and forest ecosystems. By providing a safe, nurturing, and enriching environment for outdoor play, the Children’s Garden and the Nature Explore Classroom contributes to healthy child development. Through its thoughtful design and cutting-edge educational programming, these destinations within the Garden introduce children at their most impressionable ages to the significance of plants and nature in fun, engaging, and innovative ways. To construct the 3,000 sq. ft. Nature Explore Classroom, Arbor Day Foundation and Dimensions Educational Research Foundation staff and consultants helped design and create a space specifically suited to the Missouri Botanical Garden’s needs within the Children’s Garden setting. Since its opening, children have the opportunity to build with natural blocks and tree cookies (cross-segments of a tree trunk), construct with sections of branches that were pruned from garden trees, create music with a marimba and other natural instruments, trek across log steps, climb to new heights on a large boulder, explore a sandbox, make art from plants and other natural materials, and discover nature along the new prairie walk installed in 2014. 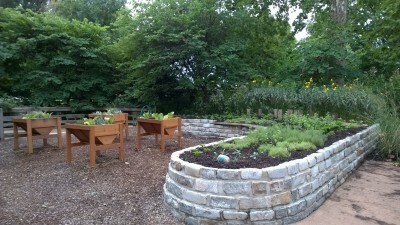 In addition, the stone raised garden provides all children the opportunity to routinely engage with staff to plant, water, weed, and even mulch what’s growing on seasonally in this special niche garden. Themes of colors, smells, and textures excite the senses and miniature gardens encourage the imagination and creative play. In the fall of 2014, new raised container gardens provided additional opportunities to make the Garden more accessible and inclusive for all visitors. In the spring of 2015, children will have a new opportunity to practice their balance, agility, and skills as they traverse along two 20′ long cedar climbers that were sustainably harvested from Shaw Nature Reserve, a division of the Missouri Botanical Garden. 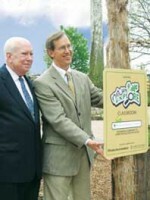 “We are pleased to partner with two outstanding national organizations, the Arbor Day Foundation and Dimensions Educational Research Foundation,” said Dr. Peter Raven, president of the Missouri Botanical Garden, shown here with John Rosenow at a recent Nature Explore Classroom dedication. The Nature Explore Classroom is located at the south end of the Children’s Garden. Various natural materials define the activity areas, including native Missouri plants, a limestone boulder, red cedar logs, sandbox, raised gardening beds, natural building materials, wooden arbors, and musical instruments. Many of the Classroom’s natural materials-including cedar arbors, sign posts, cedar climbing structures, art materials and building material-were gathered from local or regional, renewable resources. 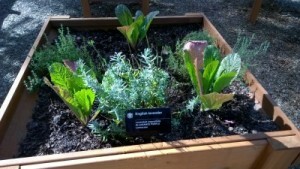 The raised garden beds includes a variety of herbs, vegetable, and child-friendly annuals and invigorate the senses of sight, smell, and touch. Mature trees, such as sycamore and tulip poplar, along with newly planted redbuds, help shade the Classroom area.